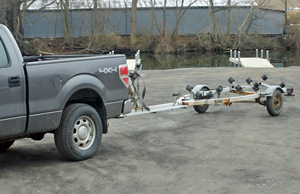 PENN YAN—The village of Penn Yan will require non-village residents and non-village taxpayers to buy trailer parking permits for the boat launch off Keuka Street starting in late May. The village board approved the measure, Tuesday, April 19, after the local law was initially adopted in March. Margarita Morehouse, keyboard specialist for the village, explained day permits will cost $5 and annual permits will cost $30. Village residents and taxpayers will not have to pay. Morehouse said daily permits will be sold at the launch via a machine and annual permits will be sold through the Penn Yan village office. She added annual permit applications will be available starting May 2. However, daily permits will not be sold until Memorial Day weekend. Morehouse added the police will check the launch for compliance. Penn Yan Mayor Bob Church said the village has to maintain the large parking lot at the boat launch. He said village residents shouldn’t have to pay for damages when 60 to 70 percent of people using the boat launch are not from the area. He added the state park charges people to use that boat launch, so Penn Yan is trying the same thing on a trial basis. “You’d be amazed at how many people are there on a Saturday,” Church said about usage of the boat launch. • The village board approved a $40,000 grant/loan application for facade improvements of the Masonic Temple Milo Lodge. Morehouse said it is 50 percent grant and 50 percent loan. 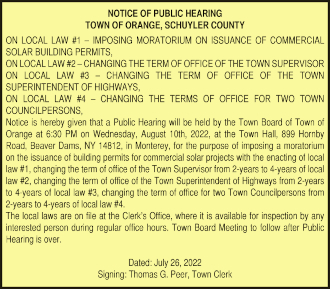 • A public hearing was also held Tuesday for the approved 2011-12 budget. The board passed the budget, Wednesday, April 13. The next village board meeting is Tuesday, May 17, at 6 p.m.